The Atlanta Community Food Bank is proud to partner with the Southeast Dairy Association to find innovative ways to provide fresh dairy products to people in need. Fluid milk is one of the most requested items, yet it is also one of the least donated items in the Feeding America network. 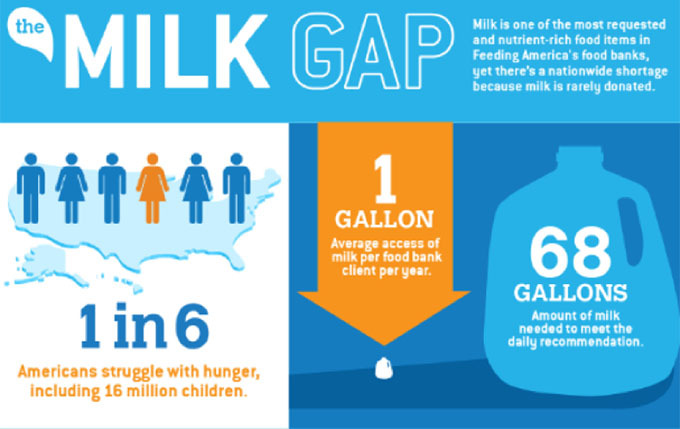 According to the Dietary Guidelines for Americans, the average person needs 68 gallons of milk per year to gain the health benefits of dairy, yet they only have access to about one gallon per year from Feeding America food banks. One in 7.5 people, or an estimated 755,400 people, in metro Atlanta and north Georgia, turn to food pantries and meal service programs to feed themselves. Everyone needs nutritious food to live healthy and productive lives, but many in our communities don’t know where their next meal will come from. One in 7.5 people, or an estimated 755,400 people, in metro Atlanta and north Georgia, turn to food pantries and meal service programs to feed themselves and their families each year. This includes more than 164,000 children and more than 64,000 seniors. They regularly face the tough choice of purchasing food or paying for transportation, housing, utilities, or medical care. In order to make ends meet, these people may water down foods and beverages or purchase inexpensive, unhealthy foods. Since 1979, the Atlanta Community Food Bank has been working to end hunger in our community by providing food for a growing network of nonprofit partners, such as food pantries, community kitchens, childcare centers, night shelters and senior centers, who then distribute food to people in their communities. Of the people served by our partners, at least 66 percent have a health condition related to nutrition and 46 percent are children or seniors–the two age groups that need the calcium the most. Distributing milk to food banks is a unique challenge because it requires the ability to distribute it quickly and cold storage space to keep it fresh. Not all of our partners currently have the capacity to do this, but we are working on several creative solutions. You may have been asked to participate in The Great American Milk Drive when you checked out at a local grocery store recently. In the last three years, Kroger donated about 30,000 milk vouchers, which we then distributed to our partners. The partners then distribute vouchers to their clients who can redeem them for a gallon of fresh milk at the store. Our partners and their clients love the convenience of this program. In the words of one mother, “My kids used to pour water on their cereal because we didn’t have anything else. Now, I am able to give them milk.” Please donate to The Great American Milk Drive. We are also working on Milk2MyPlate, which has worked well at several food banks. In this milk donation program, we connect our partner organizations with a milk processor, who can distribute more than 60 gallons of milk per week. The processor delivers the milk directly to our partners, and the food bank helps subside the cost of the milk so it is affordable for our partners. The Atlanta Community Food Bank is building a healthier, stronger community free of hunger. Joy Goetz, MS, RD, LD, CHES is a registered dietitian, certified health education specialist and the manager of nutrition wellness programs at the Atlanta Community Food Bank. She works with the Food Bank’s partner organizations to offer programming that empowers people to improve their health through project-based learning opportunities and supports pantry environments that encourage people to make healthy choices.